One of the secrets of staying warm, healthy and slim throughout the winter is to keep a constant supply of hot low-cal things to sip on in stock. Soups that contain the right ingredients can help keep you toasty, keep you nourished and keep your appetite satisfied, curbing cravings for fatty comfort foods and stuck-to-the-sofa snack foods. Be wary of canned and boxed soups from the store – these tend to be full of unhealthy preservatives, sodium, fat and hidden sweeteners. Learning to make quick, simple soups from whole ingredients at home will get you to your weight loss and health goals far faster. 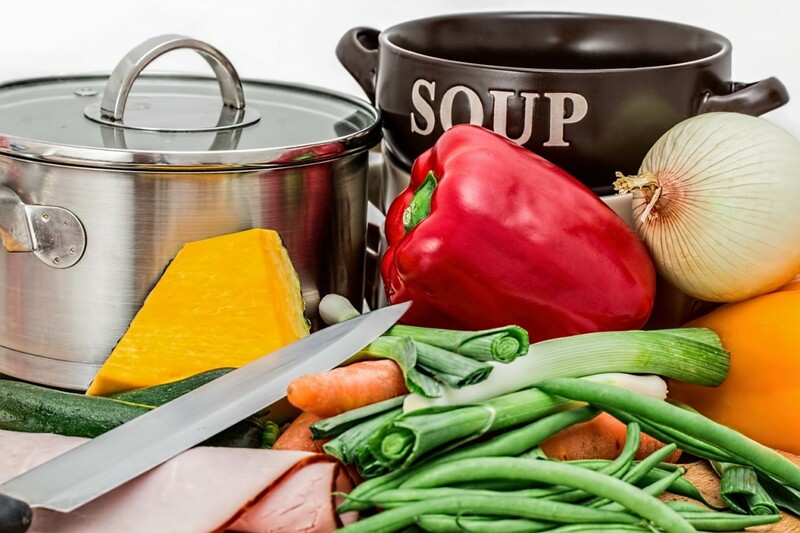 Doubling the soup recipes and cooking them up in large stock pots allows you to steadily build up an inventory of your very own ready-to-go soups in your freezer, so that you can still enjoy the convenience of ready-made soups without sacrificing your health and weight. Low-fat veggie-packed soups are great for thermos-lunches on the go, and eating a hot healthy bowl of soup before your entrée helps you eat far less calories during your main meal. These simple soups are packed with flavor and nutrition while low in calories, carbs, fat, ingredients required and prep time. They are the perfect winter mug companion as you curl up on the couch and watch the beautiful frosty weather blow by outside your window. In a large sauce pan, heat the oil and sauté the onion for 4 minutes. Add in the garlic and continue sautéing for another 1 minute. Add in the red peppers and vegetable broth. Cover the pot, bring the mixture to a boil and then lower the heat to a simmer. Skew the pot lid so that there is an opening for steam to escape, and maintain a simmer for 20 minutes, until the peppers are tender. Then turn off the heat and throw in the fresh basil leaves, stirring them around in the hot liquid so that they wilt (or stir in dried basil herbs). Add in the salt, pepper and dried chili flakes (if you want a spicier soup, otherwise omit chili flakes). Once the soup is cool enough, use a hand immersion blender to purée the vegetables and broth into a bright red, silky soup. Taste, adjust seasonings if necessary, and serve garnished with a couple more fresh basil leaves. In a large sauce pan, heat the oil and sauté the onion for 4 minutes. Add in the garlic and continue sautéing for another 1 minute. Add in the sweet potato and vegetable broth. Cover the pot, bring the mixture to a boil and then lower the heat to a simmer. Insert one whole rosemary sprig, and strip off the leaves of the other two sprigs and add the leaves into the pot. Skew the pot lid so that there is an opening for steam to escape, and maintain a simmer for about 20 minutes, until the potatoes are very tender. Remove the pot from the heat and season with salt and pepper. Once cool enough, use a hand immersion blender to purée the soup into a silky, creamy texture (add more boiled water to the pot while you blend it if the soup is too thick). Taste, adjust seasonings if necessary, and serve. For this delicious recipe, click here. In a large sauce pan, melt the butter and sauté the onion for 4 minutes. Add in the garlic and continue sautéing for another 1 minute. Add in broccoli pieces and vegetable stock. Cover, bring the mixture to a boil and then lower to a simmer. 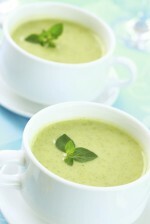 Simmer for 10 – 15 minutes, until all of the broccoli pieces are very tender. Season with salt and pepper. Once cool enough, use a hand immersion blender to purée the soup into a silky, creamy texture (add more boiled water to the pot while you blend it if the soup is too thick). Taste, adjust seasonings if necessary, and serve. In a large sauce pan, heat the oil and sauté the onion for 4 minutes. Add in the ginger and continue sautéing for another 1 minute. Add in the squash and vegetable broth. Cover the pot, bring the mixture to a boil and then lower the heat to a simmer. Skew the pot lid so that there is an opening for steam to escape, and maintain simmer for about 20 to 25 minutes, until the squash is very tender.